An architecture professor from Robert Gordon University (RGU) and three final year students have triumphed with their innovative approach to design at the Aberdeenshire Architectural and Landscape Design Awards 2018. Students Sophie Houston, Sophie Perrot and Katie Rice were all competing in the ‘Future proof living category’, which focused on design solutions to meet the changing demographics of Aberdeenshire, looking at areas such as ageing, mobility, social isolation, wellbeing, health and dementia. Sophie Houston picked up the distinction award for her project ‘A Whole of Parts – Dementia and the public realm’, which proposed a new typology for health and social care for the elderly and ultimately aims to integrate people with dementia into the wider community. Sophie Perrot and Katie Rice’s projects both picked up commendations. Sophie’s innovative resomation complex and memorial gardens project proposed a sustainable and respectful solution to the increasing issue of funeral poverty, while Katie’s ‘Vertical Community’ explores the concept of co-housing in the reconfiguration of a post-war multi-storey housing block. 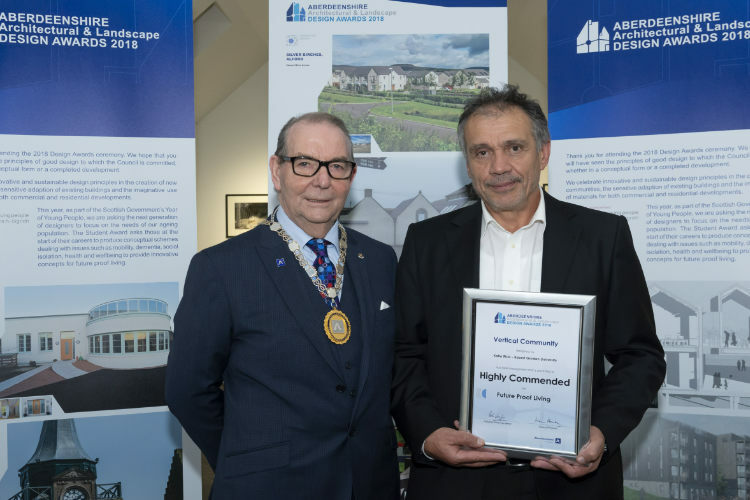 Professor Gokay Deveci won distinction in the ‘Building for communities’ category for his affordable, low-energy housing development in Fraserburgh, ‘Heritage Way’, which was opened last October by the Housing Minister. The project, which was a collaboration between Aberdeenshire Council and RGU’s Scott Sutherland School of Architecture and Built Environment, features 30 properties in a mixture of flats and houses, three of which have been designed for people with physical disabilities. 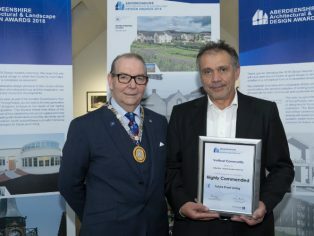 The eleventh biennial Aberdeenshire Architectural and Landscape Design Awards (AALDA) ceremony took place at The Barn inBanchory on Thursday, October 4. Councilor Ron McKail (left), Deputy Provost of Aberdeenshire Council, presents Professor Gokay Deveci with one of the awards.